Ahmadiyya Muslim Jama’at Nigeria (AMJN) has started the production and sale of its Garri (Cassava Flakes) in the country, under the brand name “MAAN Foods”. The Garri processing initiative came after the bumper harvest of acres of cassava at Ahmadiyya farm in Awe, Oyo State, Southwest Nigeria. Ahmadiyya Garri The National President (Amir Sahib) of the organization, Dr. Mashu’ud Adenrele Fashola, present several brands of the Garri-Cassava flakes at the Jama’at headquarters, Ijaye-Ojokoro, Lagos, South-west, Nigeria during the Elders group National Workshop reently. Leader of the Agricultural and business team, Sadr (Head), Majlis Ansarullah (Elders Forum), AMJN, Engr. 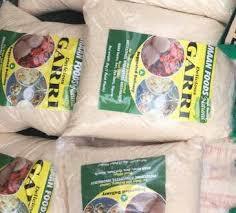 Abdul Waheed Mojeed Adeoye expressed satisfaction on the progress made on the Garri production. “Presently, our focus is on garri, we have other programs concerning food production. Once we are able to ensure mass production and marketing techniques to Nigerians across all strata, then we include others. For the time being we want to see how the common food item can be of advantage to the communities.” “You know this type of food is largely consumed in the Eastern and Western part of the country, so the demand is very high.” He explained that plans are underway to increase production for international market but first to satisfy Nigeria market. “Global market which we intend to be there might not be immediate but within the shortest time we would have all what it require, we will look into it, package it in line with government regulation,” adding that the jamaat had secured over two hundred (200) hectares of land at Awe, Oyo State for the production. Dr. Fashola, a Development Economist”, however, advised government to look inward and focus on agriculture saying it remains the only way to improve the economy and reduce poverty level to the barest minimum. He directed all Ahmadiyya schools to produce some food items for students and teachers’ consumption within the next three years. Currently, Mahmood Ahmadiyya College, Ijede now produces vegetables and cat fish for consumption. way to go ! Let other Ahmadiyya Communities copy Nigeria, the pioneer ! Yes, wow—we need to hear more this news from other Ahmadiyyah community—do not stop remind young Muslim to promote and create Job as many as possible— wow.